With LearnPlatform, superintendents can harness the wealth of educator knowledge and experience in their district to better evaluate product usage for edtech tools, identify cost savings and focus efforts and resources more heavily on what is working best in the classroom. A district-wide LearnPlatform also gives leaders a single, easy-to-use and easy-to-access hub to analyze what is working across their schools, allowing them to make more data-driven financial and instructional decisions. The Personalize Learning @ Scale framework uses a research methodology to help school districts identify their stage of edtech management and infrastructure to better understand how to drive instructional outcomes for each and every student. Elkin City used LearnPlatform to create a wealth of actionable data and comprehensive analytics to help them begin to understand which edtech was being used across the district, how educators felt about what they were using, and IMPACT™ Analysis results on key edtech products. Elkin City Schools Case Study. When districts reviewed usage of their classroom technology during the 2014-15 school year, they discovered a great deal of their investment was being wasted. 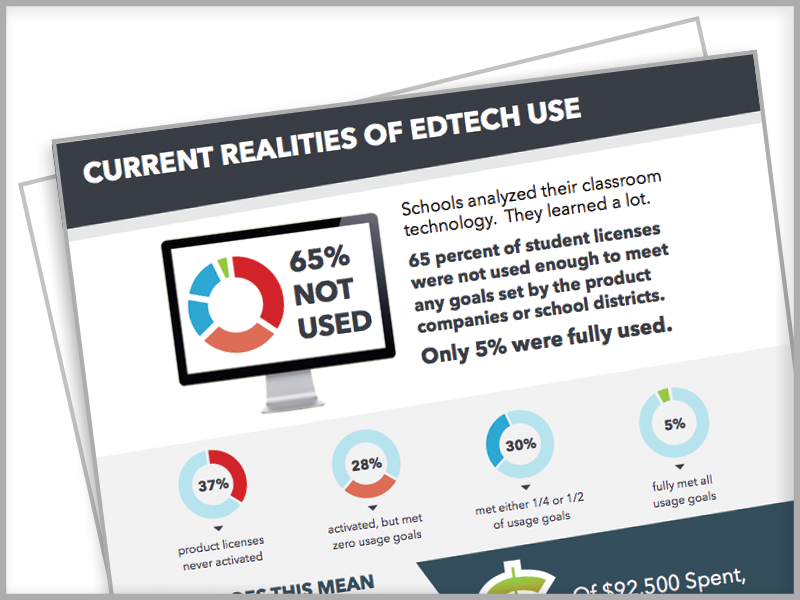 Districts found that 65% of student edtech licenses were not used enough to meet any of goals set by the product companies or the districts. Only 5% were fully used. How much is edtech was actually used during the 2014-15 school year? How did it impact outcomes & your budget? To access the most current report, click here. 2015 EdTech Usage Trends Report.